Mounts to a Wall, Roof, or 3.5" Round Pole (all options included). Works with any Spalding and Huffy Backboard and Rim Combo Kit (list below). Hardware Included (bolts to attach to wall or roof sold separately). Ships within the 48 States Free. Overhang to extend over soft/rain gutters. Overhang allows play under the goal. Offsets Approximately 10" from a pole or wall. Free Tech Support for installation help. Pole must be 11' out of the ground for rim to reach standard 10' playing height. 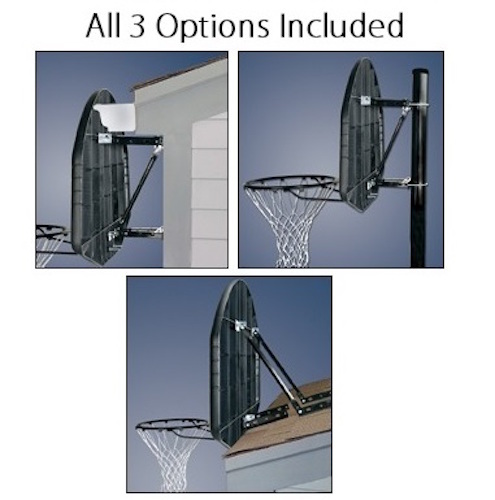 Perfect option if you have an existing pole and need to mount a new backboard without replacing the pole. Great to use on a garage where space is limited or to give your court extra room. This is compatible only with Spalding and Huffy Backboards. Does not work with Lifetime brand. 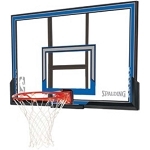 If you have a Lifetime brand backboard consider	1044 or 9594 brackets. 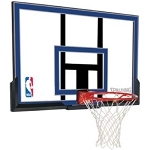 Compatible with backboard and rim combo models: 80331R, 79608, e79XXXSNCAA, e79XXXS, 79654, 79307, 79349, 79355, 79351, 79354, 80348, 80318, 80559, 80602R. 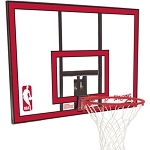 (See related items below for links to some of these backboards). Click here to see our compatibility chart and determine if what you've got works with these brackets. Simple to assemble, rugged, and by the looks of it, it should last a long time. Thanks Mounting Bracket looks great! 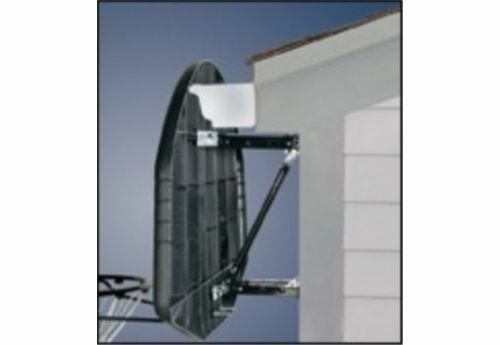 Q: I am interested in this bracket and the 54 inch acrylic backboard that works with it, but the in-ground pole in my driveway is about 13 inches in circumference, which makes it about 4 inches in diameter or a hair over 4. There is a standard size stainless steel U-Bolt with the following dimensions: 1/2” by 4 9/16” by 6 13/16”. That would accomodate the 14” pole. Do you know if the openings on the 8406SR bracket would accomodate this larger U-Bolt? Have you heard if anyone using the 8406SR on a 4” pole in this manner? If not, any other ideas to solve this 4” pole problem? Maybe a bracket made by another company? Q: How tall does the pole have to be out of the ground to get a 10' rim height? A: The inground pole must be 11 feet out of the ground to the top in order for the rim to reach the standard playing height of 10 feet. Q: how far from the garage wall will this put the backboard? A: This bracket will offset the backboard about 10” from a wall of pole. Q: I need two angle brackets for the backboard mounting bracket. Do you have any to sell or know where I can get two? Thanks!!!! Q: will this mount be accepted by a 3" round pole ? A: 3.5" round only I'm sorry to say. Feel free to contact us with any other questions. 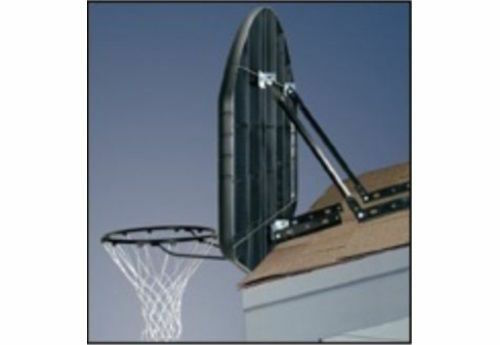 Q: How do I know if my backboard will work with this bracket? A: If you have one of these models then it is compatible: 80331R, 79608, e79XXXSNCAA, e79XXXS, 79654, 79307, 79349, 79355, 79351, 79354, 80348, 80318, 80559, 80602R. 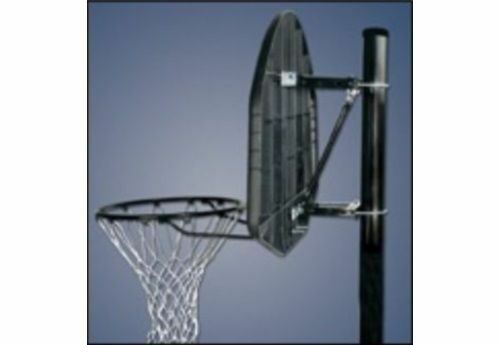 If you have a Spalding or Huffy backboard that is not listed above please call 800-558-5234 to determine whether it is compatible. If it is a lifetime, Porter, Gared, or any other brand it will definitely not work. A: Please refer to the compatibility chart on the listing. You can also call 800-558-5234. Fast Shipping: Orders for the 8406 Spalding Huffy Bracket generally leave the warehouse the next business day. Looking for the owner's manual? Click on the link below to see assembly tips, care instructions, tools and materials required, and other assembly options. Contact us if you are looking for an installer in your area as we'd be happy to point you in the right directions. Dimensions: 19" x 7" x 2"